The IADC Lexicon, a free online repository of definitions for commonly used industry terms, is now available online. The Lexicon provides a forum for critical review and analysis of terms used in drilling operations and production, particularly those used for regulatory purposes. It was developed with the intent that users would use the information to influence, improve, and where appropriate standardize, the use of terminology in legislation, regulations and standards. To populate the website, terms were drawn from many sources, broadly categorized as legislation, regulations, regulatory guidance, internationally recognized standards and IADC guidelines. These include API, OGP, ISO and NORSOK, among others. Many of the included terms have multiple definitions, demonstrating that regulators and standards developers should assume that a common understanding exists for the terms they use. More than 7,000 terms, encompassing more than 20,000 definitions, are currently included in the Lexicon. The website is evergreen, with users encouraged to provide feedback and submit relevant terms defined in additional sources to ensure the website remains up to date as the industry evolves. The Lexicon website has had more than 3,000 hits since it was launched on 27 October. Please visit the IADC website to access the IADC Lexicon. Julie Robertson of Noble Corp accepts the 2013 IADC Contractor of the Year award from Clay Williams with award sponsor NOV at the 2013 IADC Annual General Meeting in San Antonio, Texas. In recognition of her career and significant industry contributions, Julie Robertson, executive vice president, Noble, was recognized with the 2013 Contractor of the Year Award at the IADC Annual General Meeting in San Antonio. Ms Robertson began her career with a predecessor subsidiary of Noble in 1979. From 1989 to 1994, she served a consecutively as manager of benefits and director of human resources for Noble Drilling Services, Inc. In 1994, she was named vice president, administration. From 1996 through 2001, she served as vice president, administration of Noble Drilling. In 2001, she was named senior vice president, administration, a role she served until 2006, when she was named to her current position. 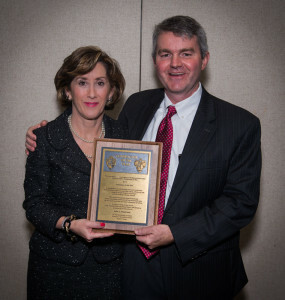 “For more than 30 years, Ms Robertson has helped guide Noble to its place as a top tier driller, not only shaping the Company’s human resources and administrative practices, but also driving Noble’s performance and extending its reputation for fair dealing, operational excellence and professionalism,” said Clay Williams, president and chief operating officer, National Oilwell Varco, while presenting the award. “I am incredibly honored to receive this award. My career has been a result of the support I have received from my fellow Noble employees. Therefore, this is truly an award for Noble and the more than 8,000 employees I have the privilege and honor of serving every day,” said Ms. Robertson during her acceptance remarks. The International Association of Drilling Contractors (IADC) awarded three industry leaders, David Reid, Don Jacobsen and Leon Robinson, with the IADC Exemplary Service Award today at its Annual General Meeting in San Antonio. 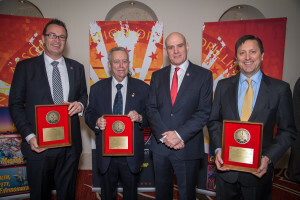 The awards recognize individuals for their outstanding contributions to IADC and their commitment to improving and advancing the industry’s safety, training and technology. David Reid was recognized for his service as IADC Division VP, Drilling & Well Services, as chairman of the IADC Advanced Rig Technology Committee and as a member of the IADC Executive Committee. Mr Reid joined Varco International 21 years ago. In that time, he has served a number of roles covering business development, product development, leadership and management. He has made key contributions in the development of today’s top drives, pipehandling, iron roughnecks, blow out preventers, integrated drilling systems and automation. He has led the introduction of modern drilling system design in drilling rigs offshore and has had an active role in the industry as a voice in addressing change in design and business models. Don Jacobsen was recognized for his service as an IADC director and conference speaker and his contributions on conference program committees, as well as his contribution to the advancement of safety for the offshore energy industry. Mr Jacobsen began his career with Shell in 1981, working primarily in the drilling and completions sector of the business. In the more than 30 years since then, he has served a variety of roles with both Hess Corporation and Noble Corporation, before rejoining Shell in December 2012. In his current role, he has responsibility for Shell’s worldwide arctic well operations and fills an interface role between Shell’s global wells organization and regulatory bodies around the world. Dr. Leon Robinson was recognized for his service as chairman of the IADC Technical Publications Committee. His work as a founding member of the committee stretches over 3 decades. Mr Robinson spent 39 years in research with Humble Production Research, which later became Exxon Production Research. While there, he had the opportunity to make contributions in many areas of technology, including mud cleaners, explosive drilling, drilling data telemetry and subsurface rock mechanics, among others. During his career, he was awarded 34 US patents and 24 international patents. He retired in 1992, and began a second career as a lecturer and instructor with PetroSkills. He has received numerous awards during his distinguished career including a designation as a SPE Drilling Legend in 2008, the SPE Annual Drilling Engineering Award in 1985, and was an inductee of the AADE Hall of Fame in 2006, among many others. Mr Robinson has a BS, MS and PhD in Engineering Physics and served in the US Army from 1944 through 1946. The updated version of IADC daywork model form contract will be available before the end of the year. However, IADC will continue to offer the older, 2003 version of the daywork form through the end of February 2014. The new form bears the revision date November 2013 and contains several revisions to address latest case law and to more clearly address its usability for multi-well and term period contracts. The new and old forms alike will be available in hard copy from the IADC Bookstore (store.iadc.org) and electronically through Forms On-A-Disk (www.formsonadisk.com). The IADC-AC AGM was held in Brisbane on 28 May, during which the group agreed to create the IADC-AC Rig Move Subcommittee to address the specific logistics and rig moving issues affecting companies in Australia. Presentations by Thomas Ingledew, General Manager for Savanna Energy Logistics and Warwick Williams with Queensland Heavy Vehicle Operations Group provided a summary of the significant task of managing the growth of the CSG industry in Australia. In June, the subcommittee met to form the Logistic Safety Code of Practice Implementation Working Group to identify and agree on the purpose and guiding principles of the group along with timeframes and specific activities and requirements for the NLSC commitment statement. In August, the IADC-AC Subcommittee held a Logistics-Rig Moving Forum. The Department of Main Roads (TMR) gave a presentation explaining new transport laws, new permitting processes and the NHVR (National Heavy Vehicle) classifications. The Australian Logistics Council’s (ALC) presentation discussed the National Logistics Safety Code (NLSC), its history and intentions and the four parts that make up the code, which include the code, guidelines, responsibility matrix and the audit tool. The final presentation discussed the Coal Seam Gas (CSG) Logistics Safety Code of Conduct. Presenters explained the relevant parties’ commitment to the NLSC-2011. The CSG Logistics Safety Code of Practice will be implemented across origin as a primary means to mitigate the risk of serious transport related accidents. The code is recognized by each of the CSG proponent groups who advised the subsequent benefits of a robust, industry-wide mitigation of heavy road vehicle safety risks across the CSG supply chain. It is a standardized tool that improves the understanding risk and clarity on legal obligations and includes independent audits which will help identify/avoid high-risk situations for contractors. After more than 30 years of exemplary service to IADC, Brian Petty, executive vice president of government and regulatory affairs, will be retiring in December 2013. During his long and distinguished career, Mr Petty cultivated relationships with government representatives, working to influence some of the most crucial regulations affecting the oil and gas industry. He also serves as chairman of the US Federal Industry Trade Advisory Committee for Automotive Equipment and Capital Goods (ITAC 2) and co-chairs the Energy Services Coalition, which is comprised of companies and trade associations seeking liberalization of trade in the energy sector. “While technical and regulatory issues are generally best resolved with openness and transparency, these are generally not considered attributes of the political system, particularly in the US. I have marveled at Brian’s ability to discern the key political touch points to any issue affecting IADC’s membership and to work political issues to IADC memberships’ benefit,” Mr Spackman added. To further reflect IADC’s commitment to championing better regulation Taf Powell and Bill Tanner have joined IADC’s Government and Regulatory Affairs Division. As the newly named Executive Vice President, Mr Powell has extensive experience in petroleum and topsides engineering for upstream E&P. His early career includes experience as a drilling engineer and drilling project manager. He joined the Health and Safety Executive in 1992, serving a variety of roles over the course of 21 years. During this time, he introduced the safety case regimes following the 1998 Piper Alpha disaster and directed strategy and regulations of the upstream oil and gas sector in the UK and commercial diving. Between 2000 and 2004, he introduced new UK key programs focused on 3 regulatory priorities: hydrocarbon releases (KP1), drilling rig heavy lift incidents (KP2) and asset integrity (KP3). In 2005, Mr Powell produced an updated version of the safety case regulations, based on the experiences of the regulator and industry. In 2005, he was appointed to the Buncefield Independent Board of Investigation as Chief Inspector for the Board of Investigation. During his 3 years on the board, he produced 9 reports and 108 recommendations to UK Ministers for safety at major hazard sites. In 2011, Mr Powell joined the European Commission as an expert advisor for offshore drilling and production. In his most recent role, he was responsible for delivering EU-wide legislation for offshore safety, environmental protection and financial liability. “This is both an important and exciting time for the drilling community to develop its leadership, and to upgrade its strategic profile with policy makers, regulators and operators. There is a public expectation that our industry will respond to calls by governments around the world for greater transparency that we conduct our business with high integrity. Equally, regulators around the world are strengthening their regimes to increase the industry’s accountability. I look forward to working in the drilling community’s behalf to support all key stakeholders efforts in these areas, and to serve the pursuit of better regulation,” said Mr Powell. Bill Tanner was recently named vice president of the division. Mr Tanner is a veteran public relations and communications executive with over 25 years of government and regulatory and communications experience, including lobbying, media relations and crisis communications. In his most recent role, he served as vice president, Global Public Relations, at United Parcel Service (UPS) in Atlanta. In addition, Mr Tanner served as head of media relations and crisis communications for Shell Oil Company in Houston. He also directed business unit communications with ConocoPhillips and served as a government relations manager for Exxon Mobil Corporation. Prior to his entry into the oil and gas sector, Mr Tanner worked on the staff of a member of Congress and other elected state and local representatives. He is a veteran of the US Navy. Mr Tanner is highly regarded for his skills in developing complex, strategic and proactive government relations and communications program. His experience includes key stakeholder engagement and outreach programs, along with a deep understanding of global oil and gas issues. Mr Powell can be reached via email at taf.powell@iadc.org and Mr Tanner can be reached at Bill.Tanner@iadc.org.